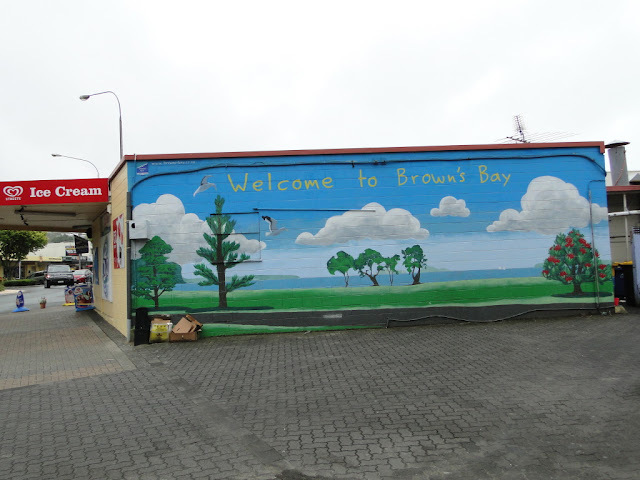 I'd missed this one when I visited Browns Bay a few weeks ago, but whe I told my friends Bill and Barbara Ellis that I had an interest in murals (well as control box art!) for Timespanner, they sent this image through to me. Thanks, Bill and Barbara! If you can't say anything nice, then say nothing, so I shan't say a thing. That's an odd thing to say, Andrew. Everything all right over your way? Sorry if I wasn't clear. I simply meant that the mural wasn't to my taste. I was kind of thinking aloud. Delete if it offends anyone. No worries, Andrew. You're always welcome to say it as you see it. At least this brightens the streetscape, which is always a good thing. Cheers!